The meat-eaters are an order of mammals with seven families. 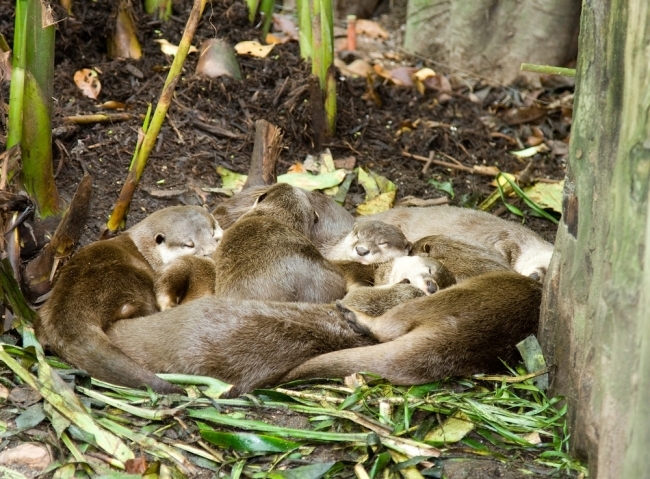 Among those, the otters are one of the five groups of the mustelid family. Cousins include the badger, skunk and weasel. The otter species currently divide the earth between them, neatly occupying almost every habitat that their ecological niches allow. Only two species cover Eurasia and North American freshwater (The sea otter of the American west coast and NE Asia is largely marine). These two species are not closely related. The Eurasian Lutra lutra is distinguished by having the smallest nose of any otter. And all this claptrap for what? Well, otters could be regarded as biological indicators of rivers' quality after their recent experience (over the past 100 years). In the UK, they've been hunted for centuries, as otters still are in many states of the US and provinces of Canada. But pollution has also made them locally extinct in most English rivers in the past. Along with the sea-otter, the Eurasian species has suffered most from pollution in the emissions of oil, organochlorine insecticides, organic waste and heavy metals from industry into rivers. Often the fish stocks have been destroyed, or the water is acidified, to the same effect. The three species noted here are all recorded as having had high concentrations of pesticide in their fat tissues. In the UK, dieldrin, one of the major insecticides used in the 1950s is sensibly associated with the otter's decline that began in that decade. As with declines in birds of prey during that period, reproductive failure reduced populations, rather than direct toxic effects. High levels of mercury can occur in rivers, as well as other ions such as lead and cadmium. Natural causes exist, but mining drastically increases risks of metals' pollution. No effect has yet been proved on otters, but it's likely that sub-lethal effects may affect behaviours, as they do in humans. As we can't analyse many otters for pollutants, spraints (their characteristic sweet-smelling faeces) can be tested. As the species in developed countries regain their original habitat to some extent, the hope is that we can easily gain information on the health of a river and its tributaries. Any company escaping waste regulations could easily be located by checking the "river wolves" - the locals name for the otter population! Of course, knowledge of the state of an otter population would not go amiss with those are species we hardly ever see. For example, the South Americans are lucky yet again to have the almost unseen and most endangered sea cat (Loutra feline) on rocky coasts and, in the mighty Amazon basin, the 6 foot (2 metre) giant otter. Mercury poisoning, this time from gold mining, is a major hazard in the rivers and the state of the water can now be gauged from the state of the otters - perhaps we can finally put a break on the Amazon's exploitation by using the resident organisms instead of abusing them.